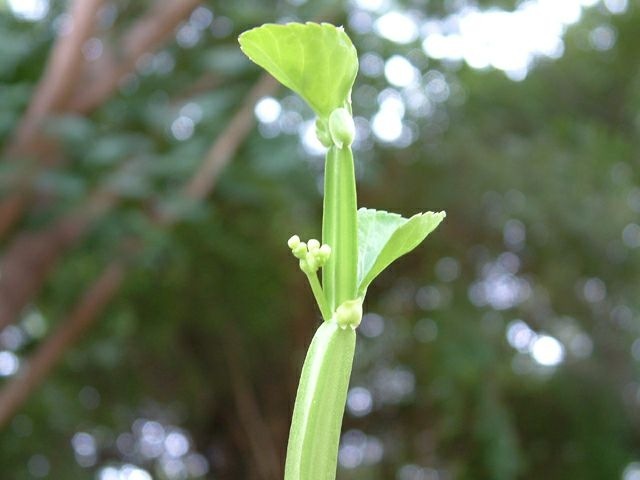 Cissus Quadrangularis is a wild plant found in India, South Africa and in hot regions. These plants are not usually cultivated but due to the demand of the plants for medicine its now cultivated in some parts of the world. gether. If the plant is planted in irrigated areas you will find more leaf and tendril than non-irrigated areas. When the plant is full grown, flowers start to appear and one seed is formed on each pod. lants are cut between the two nodes 30 cm and dipped in cow dung slurry and /the plant can be planted in the prepared pits. A pit of 15×15×15 cm spacing at 5 ft is made. Fill the pit with one part of Vermi-compost one part of dry cow dung, one part of sand and one hand full of bone meal. Mix the same and fill the pit. The plants which are dried in both direction of the field. For first 15 days Cissus Quadrangularis should be watered every alternate days after that only once in every four days (hot climate). Never allow water to stage near the plant. mboo for support so that the rope does not hang down by weight. When a plant starts to grow support the plant towards the bamboo. When plants reaches the rope put top part of the plant above the rope. Then the plant start to grow downwards. When it is about to reach the ground, again you will have to bring the tip of plant to the top. Then new shoots start to come. Where can I get clippings?